The dark secrets behind America’s meat industry are enough to make us sick – and according to journalist Christopher Leonard, that’s only the start of it. Our health, the well-being of animals and large swaths of rural America are all under threat by America’s monopolized meat industry, Leonard says, and the full extent to which it’s taken over should be making us a lot angrier than it is. “It’s been very telling to me how bothered consumers are when they learn how this industry really operates,” Leonard told Salon. “The Meat Racket,” Leonard’s new exposé, lays it all out on the chopping board: how virtually all of our meat is produced by the same four companies, led by Tyson, how those companies manage to keep the farmers who raise their chickens under crippling debt while ensuring that poultry prices stay high, and how the only real choice left for the consumer is to either partake or opt out of meat altogether. Leonard spoke with Salon about how he brought these heavily guarded secrets to light, and explained why those who would defend the industry are apologists for a system gone wildly awry. This interview has been edited for length and clarity. First, could you tell us a little bit about your relationship to the meat industry? How were you able to get this inside view of what’s going on in Tyson’s boardrooms? I’ve been a business reporter in the Midwest for about 10 years. I covered agribusiness for the Associated Press, and before that, I worked at smaller newspapers. And in that role, I kept kind of bumping up against the industrial meat system. I wrote my first story about Tyson foods in 1999 for a newspaper, and the more I encountered this system, the more I became fascinated with it. It’s a remarkable experience to walk into one of these giant factory farms and see 75,000 chickens on the ground in front of you. But the seeds for this book really came in 2004, when I went down to this little town of Waldron, Arkansas, to report on chicken farmers down there. And I was just absolutely stunned by just how much power Tyson had over these farmers, and how powerful it was in this little town. And I wanted to find out how we got to this point, where these companies can act like virtual dictators in these towns where they operate, where they have regional monopolies. And I wanted to also understand how this system really works from the inside. So, I just spent a lot of time trying to get people inside the company to talk to me and share their stories, so I could understand how things really work, and why the company behaves as it does. And that effort was really helped in 2008, frankly, when I just randomly ran into Don Tyson at a restaurant, and he agreed to talk to me about this, and his career and how he built the company. We did a couple of on-the-record interviews, and it was really invaluable to me, to help understand why the company operates how it does, and how history shaped it, and how Don Tyson himself kind of shaped it. I wonder why he agreed to talk to you. You call the industry a racket, and in the book you describe how it’s really taken over the food system. Is that something that Don Tyson was aware of? Or did he just have an entirely different way of seeing it? Unfortunately he passed away in 2011, so I was never able to go back to him with the final book and talk about it. He was definitely proud of the relationship Tyson built with the farmers, for example. But there were just a lot of realities on the ground that were really disturbing — I mean, there’s a mountain of evidence in civil lawsuits, federal investigations that show the abuses that happen with farmers. Maybe part of it is that when an organization is so big, the people at the middle can be removed from the effects of how the company operates. Reporting on the actual ground, you see things as they really play out, and so that’s how the reporting led to the conclusion of the book, which is that just a few companies have incredible control over the market. They have the ability to virtually dictate the price they pay for chicken to chicken farmers now. And part of that’s due to the fact that there’s really very little competition in the business anymore. One of the things in the book that really surprised me was how Don Tyson kind of pushed chicken on McDonalds — he thought this was a good idea before they did. How much of the current state of the food industry is Tyson itself directly responsible for, and to what extent is it just taking advantage of the way things are? It’s absolutely mixed. Tyson Foods is a pioneer of the current model of industrial meat production. The company didn’t invent contract farming or vertical integration on its own, but it borrowed these techniques that other companies were using in the South, especially back in the 1960s. But what Tyson did was it perfected this model, it took this model and ran with it, and expanded more aggressively than any of its competitors. By the 1990s, Tyson Foods was the world’s biggest chicken company. And then, all the other meat companies had to compete with Tyson and basically imitate the company to keep up with it, and to keep up with its growth. So Tyson borrowed, and was very smart about borrowing practices from other firms, but it certainly pressed ahead in a really aggressive way and transformed the industry around it. One of the things I saw clearly was that even people that didn’t make chicken — the companies in the pork business and cattle business — had to compete with Tyson. Because the company started making chicken so much cheaper that it was hurting their sales, and hurting their bottom line, so it forced them to react, and to start imitating the company just to stay in business. By now, you write, “American consumers are using their money to support a system that keeps farmers in a state of indebted servitude.” Is it possible at all to avoid this, or is it so overwhelming at this point that there’s no real way to get around that system? I mean there’s obviously the option to go vegetarian, but if you eat meat, as I do, the only way to truly opt out of this system is to buy your meat directly from a farmer or livestock producer. And there’s actually a pretty vigorous market for that at local farmer’s markets. There’s a lot of entrepreneurial energy in rural America with these people who are raising cattle and chickens and hogs on their own, and doing it in a different way, and selling directly to the consumer. So that’s one way to opt out completely. But it’s pretty impractical, I think, to ask consumers to buy all of their meat from the local farmer’s market. It’s hard to do when you’re trying to support a family, in terms of time and money. When you walk into the grocery store or a restaurant, it is virtually impossible to boycott these meat companies, the big four that dominate the industry today: Tyson Foods, Cargill, JBS and Smithfield. You can walk into the meat section and see a wide variety of brand names, but they virtually all trace back to these four companies. And that’s one of the big points of the book: there’s not competition, viable and vigorous competition in the meat industry anymore. These firms have locked up the market. So trying to boycott them is really fruitless, especially considering the fact that they make so much unbranded product: rotisserie chicken, restaurant meat, things that don’t even carry their brand name. So they’re virtually impossible to boycott at the grocery store or the restaurant. And what about the farmers themselves? If there is this opportunity, a market for other ways of raising animals, and they’re being driven into debt and losing their farms because of the way the meat industry is treating them, why aren’t they pursuing those other options? The situation is absolutely the worst in rural America, in terms of competition. You can cite these facts of how consolidated the market is. For example, three companies make almost half of the chicken in the United States, four companies make 85 percent of the beef. But when you get down to the local level of any town in rural America that produces meat, and where livestock production is still a pillar of the economy, you see that these companies operate as regional monopolies. They’ve consolidated the business to such an extent that a feedlot owner in Nebraska, for example, or a chicken farmer in Arkansas, will often have no viable choice of who they can do business with. You can have contract farmers in Arkansas, some of the towns I visited, that if they’re lucky, they might be able to have two chicken companies that they could sign a contract with. But when you only have two options of who to do business with, those two companies don’t have to compete with each other in terms of contract layout or how much they pay you. And so I saw time and again, farmers do not have a real choice when they’re facing bad practices or they’re being underpaid; they simply don’t have another party that they can go to, that they can do business with. You write a bit about how the Obama administration attempted to reform the industry back in 2010, and wasn’t very successful. What did they try to do, and what didn’t work about it? What would need to be done to make more meaningful change? Barack Obama came in on a platform of change and reform on this issue. Obama ran to the left of Hillary in Iowa, and was promising to pass more antitrust reforms for these businesses. And in essence, Obama and his secretary of agriculture Tom Vilsack said they were going to pass a series of sweeping regulations that would have constrained the market power of the big four meat packers. These new rules would have given farmers more rights and more bargaining power with the big companies they do business with. They could have added more transparency to the markets, and they would have strengthened the antitrust tools that the USDA has to go after these companies. To take one small example, there’s this kind of obscure agency in the USDA not many people have heard of called the Packers and Stockyard Administration. It’s based on a law called the Packers and Stockyard Act, that’s really been rendered toothless after decades of litigation from the big meat companies. And Tom Vilsack was going to pass rules that would have really put teeth back into the Packers and Stockyard Act. What happened was, in 2010, not surprisingly, the meat industry lobbyists in Washington, like the American Meat Institute and the National Chicken Council, launched a very well-funded, very well-coordinated lobby campaign to get this reform effort killed. The meat companies and their lobbies spent $8 million in 2010 alone, just lobbying against this rule. That doesn’t include campaign contributions, that’s just paying people to take congressmen out to lunch, work the halls of Congress, try to convince lawmakers to kill the reform effort. And it was remarkably successful. It seemed that Tom Vilsack and his political appointees were really just caught off-guard by the fact that the meat industry would fight back. And the minute there was opposition, they started to retreat on their own initiatives, they delayed their own reforms, and they really gave the playing field over to these meat lobbyists who took full advantage of it. And the reform efforts were all but dismantled by the end of 2011. Which, in a way, left the big meat companies more powerful than they were before Obama was elected, because they showed that the federal government was really incapable of doing anything about this problem of monopoly power in the meat business. It seems unbelievable that they didn’t see that coming. It was remarkable to me as a reporter covering this. I mean, these reforms were going to go after significant power that these companies have, and of course, it seems obvious the firms would fight against it. These are entrenched interests and it’s just really instructive to look at what happened a hundred years ago. We had a similar situation where five companies dominated the meat industry. Incidentally, the industry is more consolidated today than it was a hundred years ago. But you had presidents like Teddy Roosevelt, who not just anticipated a fight, but they relished the fight, and it just seemed like there wasn’t a stomach today to take on corporate lobbyists. I don’t understand it, because the problem here is that when you have monopoly power, it hurts the farmers that raise the meat, it hurts the consumers that buy the meat and that doesn’t seem like a really difficult sell, politically: to try to stimulate more competition and more transparency to the market. But they just seemed like they didn’t want to articulate that argument, or take on that fight. To what extent do you think free-market competition would make things easier for the small-town farmers whose lives you’re describing, who just aren’t really able to make it right now? It seems like it’s still going to be a really tough industry to be in. Agriculture is always a tough business. It requires seven days a week, sometimes at work many hours a day, it’s a hard job. You know, working in the city is a hard job too. Desk workers have to work overtime and they get underpaid as well. Let me just say agriculture’s a hard job, right? And nobody is asking for an easy ticket here. But there is no question, and there is a lot of evidence to support the fact that when you have more competition farmers get a better deal. Transparent markets help a farmer get a better price for their product. And when they have more firms to choose to do business with, it leads to better contract terms for farmers. 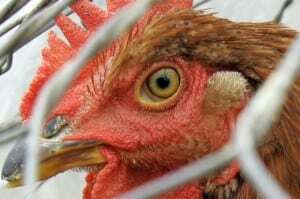 There’s one study in the book that looked at a chicken-farming region in Louisiana over a period of 40 years, and showed categorically that as competition decreased, the terms of business got worse and worse for those chicken farmers. So it definitely seems to reason, that if you give people a choice of who to do business with, create more competition, things will get better for the farmer. The New York Times reviewed your book alongside Maureen Ogle’s. I spoke with her a few months ago, and she kind of takes a different tack. She defends the meat industry in a lot of ways, and argues that the consumer demand for cheap, readily available meat is fueling a lot of the industry’s problems. Do you take issue with that assessment? I don’t think the consumers are demanding that chicken farmers be exploited and live on the edge of bankruptcy. I don’t think consumers are demanding that lobbyists in Washington are now scaling back the number of food safety inspectors to poultry plants, while increasing the speed of production at these slaughterhouses. It’s been very telling to me how bothered consumers are when they learn how this industry really operates, and how much power a few companies have over this business. And I would like to point out that you can industrialize the meat system and make meat more affordable without handing over power to a few monopolistic companies. Consumers are not demanding four companies gain control over the market for meat. They are not demanding that four companies have enough market power that they can actually cut supplies to keep meat prices higher. And they’re not demanding that competition in rural America decline to the point where farmers don’t have anyone to work with besides the companies underpaying. So, I don’t necessarily see where you get the idea that consumers are demanding a monopolistic system like the one we have today. The other argument Ogle made was that the meat industry has a very slim profit margin, that they’re raking in so much money that they can then withhold from the farmers. In other words, that they’re not purposely screwing people over. Here’s my take on that. There’s a little retailer out of Arkansas called Wal-Mart Stores Inc. That company has a really thin profit margin, sometimes around 1 percent, but you don’t see anybody sitting around talking about how powerless Wal-Mart is, or the fact that the Waltons don’t have any money. Just because you have a thin profit margin doesn’t mean you don’t have a lot of market power, and that a few people aren’t making a ton of money in these corporations. And the most important thing is the fact that these companies are earning record profits today. While farmers are living at the edge of bankruptcy, and consumers are spending more on meat, and there’s data from the USDA that shows the top four meat packers were able to actually increase their profit margins in recent years, even as the economy was stagnating, consumers were cutting back their spending on meat and farmers were facing hard times. These companies were able to widen their profit margins, sometimes doubling their profit margins from year to year, in that kind of situation. To me, that tells me these firms have a lot of market power and so I’m not convinced that just because their profit margins might not be as thick as Exxon Mobile’s or Apple’s, it doesn’t mean that the system is working well, or that it’s competitive at all. Follow her on Twitter @readingirl, email labrams@salon.com.